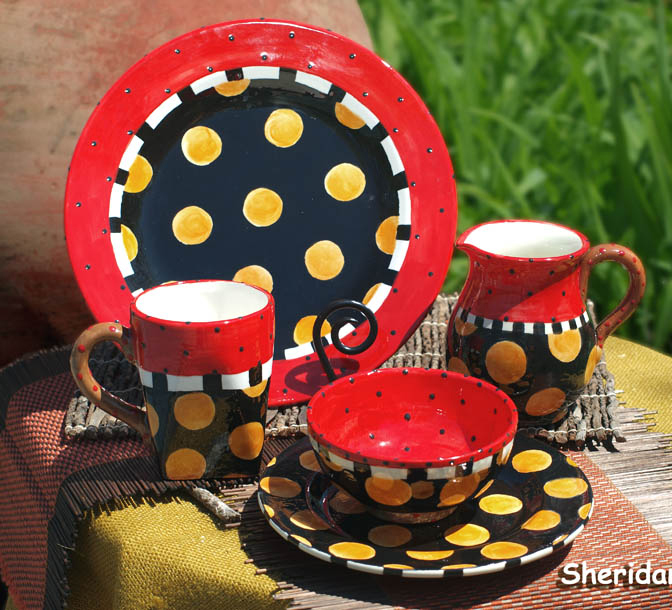 Dots, stripes, swirls and lots and lots of color give Pat Church’s painted ceramic dinnerware its flair. She begins with earthenware bisque, then draws designs with pencil and fills in with colorful underglazes to create graphic and playful themes. Each unique piece of low-fired pottery has three layers of food-safe glaze applied and is dishwasher safe. Products include pitchers and mugs, plates, platters, bowls, bakeware, place settings, and accessories. From her studio in Rogers, Pat has combined self study with formal pottery training to find her niche with the colorful glazes she prefers. “After years of trial and error I finally learned how to produce an attractive, usable piece of dinnerware. I would create pieces for my sisters and for friends as gifts.” Soon Pat’s love of ceramics evolved and LPOMA, “Little Piece of My Art,” was born.